He now requires the parliament’s approval for the decree to come into force. Photo distributed by Ukrainian Navy Press Service of two of its vessels near Crimea. UKRAINE’S PARLIAMENT HAS approved the introduction of martial law in border regions today, as Russian state TV aired images of Ukrainian sailors captured after Moscow seized three of Kiev’s ships in a confrontation at sea. The decision came after Russian forces boarded and captured Kiev’s ships yesterday, with Moscow accusing the vessels of illegally entering Russian waters off the coast of Crimea in the Sea of Azov. 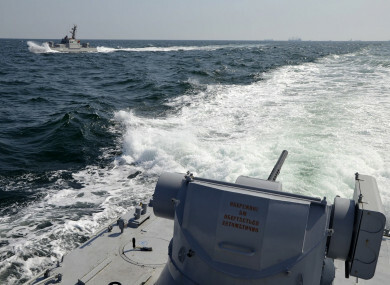 Ukraine said a Russian border guard vessel rammed the tugboat in “openly aggressive actions” and then fired on the ships, immobilising all three. “I want to emphasise separately that we have all irrefutable evidence that this aggression, this attack on the Ukrainian Navy’s warships was not a mistake, not an accident, but a deliberate action,” President Poroshenko said in a statement last night. Ukraine said six of its soldiers were injured, two seriously, but Russia’s FSB reported only three had suffered non-life threatening injuries and were given medical treatment. Protesters, some armed with flares, rallied outside the Russian embassy in Kiev last night in response to the latest development. The UN Security Council is holding an emergency meeting today to discuss the escalation, US ambassador to the UN Nikki Haley said. The meeting was requested by both Russia and Ukraine, diplomatic sources told AFP. The seizure has sparked alarm among Kiev’s Western allies. “We expect Russia to restore freedom of passage at the Kerch strait and urge all to act with utmost restraint to de-escalate the situation immediately,” the European Union said in a statement. NATO also urged “restraint and de-escalation”, and called on Russia “to ensure unhindered access to Ukrainian ports in the Azov Sea, in accordance with international law”. Ukraine’s foreign ministry said the “aggressive actions” were a violation of international law that would be met with “an international and diplomatic legal response”. “Having breached this morning the Russian border, the three Ukrainian ships — the Berdyansk, the Nikopol and the Yani Kapu — tried again on November 25 at 19:00 (Moscow time) to conduct illegal actions in Russian territorial waters,” the FSB said yesterday. The FSB, which oversees the border guard service, also said the Ukrainian ships had failed to respond to the “legal demands” of the Russian authorities. Crimean leader Sergei Aksyonov wrote on Facebook that he “was sure the Western masters of the Kiev regime are behind this act of provocation”. Pyotr Tolstoy, deputy speaker of the Russian parliament, warned on Facebook that “the Ukrainian puppet authorities… are risking unleashing a large military conflict”. One thing is clear: Russia won’t allow military provocations in its territorial waters. Ukraine said it gave Russia advance warning of its ships’ route, which its vessels are obliged to take to reach the Sea of Azov. In September, the Ukrainian navy complained about “acts of provocation” by Russian border guards against its ships taking the same route. The United States, a key ally of Ukraine, is opposed to Russia’s takeover of Crimea and is looking to reduce Ukraine’s dependency on Russian gas pipelines. Email “Ukraine backs martial law after confrontation at sea with Russia”. Feedback on “Ukraine backs martial law after confrontation at sea with Russia”.